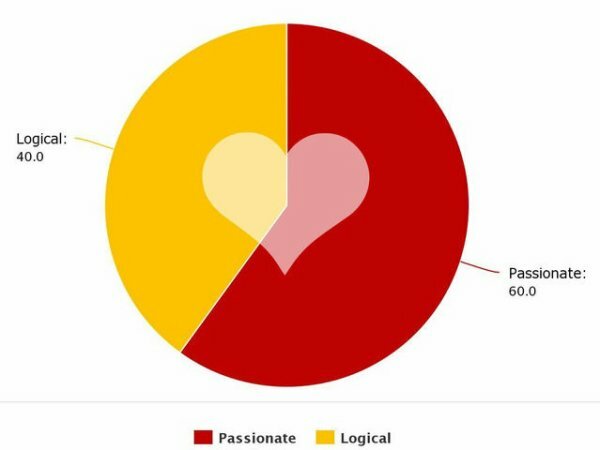 Your heart is 60% Passionate and 40% Logical. Your heart is mostly romantic, colorful and sensitive, but the other part is driven by logic and guides you during challenging times. In most situations, you follow your instincts and lead with your heart, but there have been times when that has led you towards heartbreak. Therefore, the logical side of your heart has become much stronger over time and you've learned to listen to it more often than you did in the past.